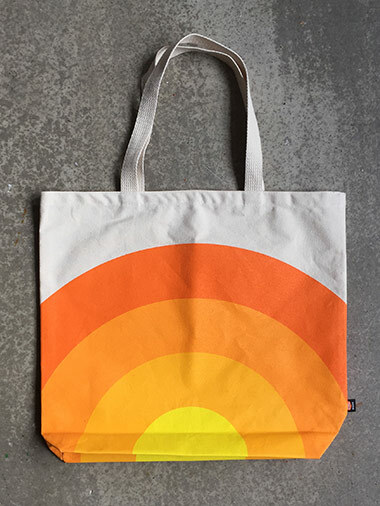 Draplin Design Co.: DDC-146 "Thick Lines Tote Bag"
Welcome To The DDC Merch Store! DDC-001 "Factory Floor Issue Action Cap"
DDC-003 "DDC Factory Floor Issue Yardstick"
DDC-005 "Pacific Northwest United States Patch"
DDC-006 "Spare Change Containment Apparatus"
DDC-007 "Build Something Carpenter Pencil"
DDC-008 "Sharpie of Black Death"
DDC-009 "The Good Wood Pencil Set"
DDC-010 "Pencil of Six Sides"
DDC-011 "Adventures In Plastics Clic Pen"
DDC-012 "Factory Floor Issue Longhand Set"
DDC-013 "Field Notes Brand Six Inch Ruler"
DDC-014 "2002 Once-A-Month Card Series"
DDC-015 "North Lock Torso Cover"
DDC-016 "2007 Work Station Calendar"
DDC-019 "DDC Classic Torso Cover"
DDC-020 "Long Breed Gary Torso Cover"
DDC-024 "Adventures In Plastics Click Pen"
DDC-025 "Michigan Souvenir Patch" and "Michigan Decal"
DDC-027 "Pencil of a Mechanical Nature"
DDC-028 "Open Road Div. Key Chain"
DDC-031 "Reversible Screwdriver with Magnet Top"
DDC-034 "DDC First Aid Kit"
DDC-036 "Chest Pocket Torso Cover"
DDC-037 "Pretty Much Everything Poster"
DDC-041 "DDC vs. Alaska Poster"
DDC-042 "Freight Train Torso Cover"
DDC-043 "Two-Bit Vinyl Card Case"
DDC-046 "Ohio, USA Torso Cover"
DDC-049 "DDC Brand Emery Board"
DDC-056 "Open Road Torso Cover"
DDC-057 "Open Road Tire Checker"
DDC-060 "DDC Brand Pill Box"
DDC-065 "DDC Shipping Dock Beanie"
DDC-086 "DDC Jean Jacket Pin"
DDC-092 "Space Shuttle Tribute Patch"
DDC-105 "COAL x DDC x USA Action Cap"
DDC-121 "Thick Lines Magnet Set"
DDC-124 "Get Cosmic Torso Cover"
DDC-137 "Marc Maron - Aladdin Theater / Revolution Hall Poster"
DDC-146 "Thick Lines Tote Bag"
DDC-149 "DDC Hardware Action Cap & Typeface"
DDC-155 "DDC One Cuff Beanie"
DDC-165 "Stars & Stripes Mini Print Set"
DDC-166 "Fire! Fire! Fire! Lighter"
DDC-171 "Get Cosmic Dark Matter Gravity-Defying Device"
Our “Sunrise” design from our Thick Lines poster series, applied to a bomb-proof tote bag. A little splash of color for that day at the beach, run to the grocery store or record store stop. Made right here in Portland! 01. Proudly printed and manufactured in the U.S.A.
02. Thick inks on durable cotton. 03. Will hold just about anything! 05. 4-color graphic printed on both sides! For customers using PayPal, click the link above they’ll take it from there. For customers who aren’t using PayPal, send us an email to “orders(at)draplin.com” and we’ll get back to you with an address to ship the funds to. We accept money orders and cold hard cash, so, get with it, man! All orders are shipped out as fast as we can. Usually a couple days after the order comes in. We ship everything USPS “First Class” rates. If you want quicker shipping, contact us and we can ramp it up to USPS Priority, or whatever you need. We aim to please! We cover the shipping in the states, but charge the basics for international orders. Before you place the order through our PayPal account, send us an email to “orders(at)draplin.com” and we’ll get you a shipping quote for the goods you are interested in. As simple as that! Thanks! ©2018 DDC Dry Goods Div., Merch Dept., Portland, Ore.